It has been a long trek for Nassebawanga Fausta, and her 14-month-old baby girl, Nakirangwa, from the island of Bugala on Lake Victoria, where they live, to a sleeping sickness centre on the mainland Uganda. "My child fell sick two weeks ago so I took her first to the local clinic but they were unable to diagnose her problem," said Mrs Nassebawanga. "Then I was sent to a district hospital far away from home and I had to pay for treatment for 10 days before they identified sleeping sickness as the cause of her problem." Despite a 10-hour boat trip and an uncomfortable bus ride to the hospital in Kampala, the pair now face another marathon journey - to Uganda's main sleeping sickness treatment centre at Namungalwe where, it is hoped, the child can successfully be treated for the disease. 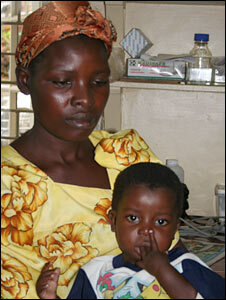 Trypanosomiasis, or sleeping sickness, has similar symptoms to malaria, making it difficult to diagnose. Untreated it moves to the spinal column and brain resulting in mental confusion and eventual death. Several hundred kilometres to the north, in the village of Aburawak, young vet Patrick Opondo is overseeing a cattle spraying programme. Scores of local farmers have brought their animals to be treated for ticks and tsetse flies. It is a chaotic scene as noisy beasts are funnelled into a narrow passageway of fences known as a "crush", while their lower quarters are sprayed with chemicals to kill the flies. The project is part of a new animal health programme that is helping to eradicate the deadly strain of sleeping sickness which is threatening the life of young Nakirangwa. Research carried out at Makerere University in Kampala and the University of Edinburgh, Britain, has identified cattle as the main source of the parasite that causes trypansomiasis. Tsetse flies feed on the cattle's blood and then bite humans, infecting them with the parasite. The research has now proved a clear link between the movement of cattle in Uganda and the spread of the acute form of the disease. 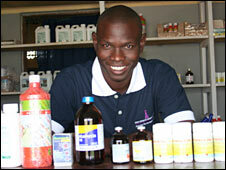 Mr Opondo is one of a new breed of vets who are setting up in private businesses. They sell the chemicals for the spraying and spread the word among farmers that - by getting rid of the tsetse flies and ticks - they will protect the animals and their own families from infection. 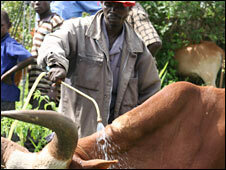 Cattle are also being "block"-treated with drugs to prevent the spread of the parasite. "When my cattle are sprayed they grow fat and very healthy, and when the animal is healthy the value is also healthy," says farmer Rose Amuge who lives in Aburawak. "After the spraying, the flies that cause the disease sometimes die or go out of the area of the villages, so that helps the people because they do not become infected and, actually, people are no longer attacked by them." Mr Opondo trained at Makerere University but, like many young vets in Uganda, found it hard to get employment. "Setting up in private business is good for me because I am dealing in cash and not waiting for a salary," he said. "At first farmers were reluctant to take part but now they can see the benefits, the business is growing and we are also helping to fight a terrible disease." The curriculum at his old university has now been changed to include this new, community-based approach to animal treatment, in the curriculum. "We are transforming the curriculum for student vets from being an 'ivory tower' curriculum - where you turn out students to the street to look for jobs - to students who can now go to communities and solve problems so they are being trained directly to deal with the challenges," said Professor John David Kabasa, dean of the university's vet school. Funds from the UK's Department for International Development are now to be used to expand the programme in Uganda. And the possibility of introducing similar networks of private, community-based vets throughout the areas of Africa affected by sleeping sickness is being considered. Meanwhile, for Mrs Nassebawanga and her daughter, the journey to seek help is finally at an end. Treatment for sleeping sickness is free in Uganda and they have reached Namungalwe Hospital, where the girl is responding to the drugs she has been given.